Today’s post is going to be very simple. 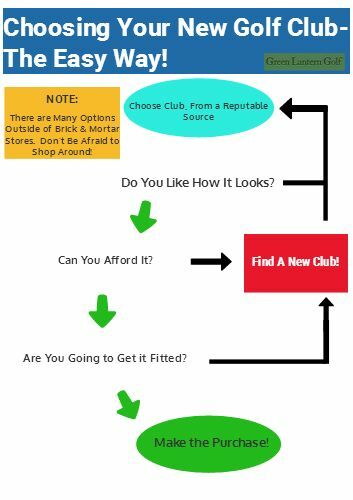 It’s an infographic flowchart that will help you when you’re ready to start choosing new golf clubs! We all want to know if the golf club (or clubs) we’re looking to buy is going to work for us, but we read lists or see infographics that offer up way too much vague information. When you’re choosing your new golf clubs, where do you turn? See? Simple and painless. There’s really not that much that goes into choosing new golf clubs. We just let the marketing departments confuse us with all their fancy copywriting. That’s more fancy talk for “ads that get you to buy”. Here’s the thing: when it comes to buying golf clubs, it’s about personal preference. If you’re the type that likes a certain brand, go for it. If you don’t care, get what you like and can afford. The only thing I’d suggest, is to get custom-fitted. That, much more than worrying about brand names, will do help you play better golf. See these two hybrids? When I was in the market for new hybrids, I chose these heads from Diamond Tour Golf. I hit the 3H (20*) 225 yards. The 23* 4H, 215. Wanna know how much these cost? Shafts: $50 for the pair. Axiv H105’s. It’s a nice color of blue, as well! Price does NOT correlate with performance. Don’t let any smooth marketing fool you; get what you like, what you can afford and get it fitted. Make sure the clubs fit within your set. Get a shaft that fits your swing, and a grip that fits your hands. It’s not magic or marketing… it’s just a fitting.